I had some of my meagre crop of jalapeños left that needed to be used. I love pepper jelly with a smear of brie on a cracker. 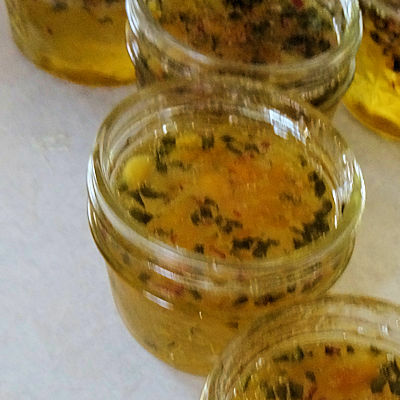 It was time to make Golden Pepper Jelly. I had an envelope of Bernardin Liquid Pectin so I went to their site to look for a recipe. They had one for Habanero Gold Jelly. It used dried apricots which appealed to me. I didn’t have habanero peppers but I decided I could use the recipe as a base and make it with the ingredients I had. I started by putting six 125 ml (1/2 cup) jars in my hot water canning and boiling them. I kept them in the hot water. I sliced the apricots into thin slices and then cut across the slices to get a fine chop. I measured the chopped apricots to get 75 ml (1/3 cup) I put them in a stainless steel pot with the vinegar for 4 hours. It is important you use a stainless steel or other nonreactive pot. I seeded the peppers and cut them and the onion into an 1/8 inch dice and measured the chopped peppers to get 125 ml (1/2 cup) peppers. I measured the onion to get 50 ml (1/4 cup) onions. I added them to the apricots. I put the sugar in and brought the mixture to a full boil that could not be stirred down. I added the pectin and boiled for 1 minute stirring constantly. Remove the jelly from the heat. If there is any foam on top, skim it off. I had very little foam from this recipe. I poured the jelly into the hot jars using a canning funnel. Fill to 1/4 inch from the top of the jars. Wipe the edge of the jars with a paper towel. Put a snap lid that has been soaked in hot water on the jar and put a screw band on and tighten to just fingertip tight. Put the full jars back in the hot water canner and bring the water to a boil. The recipe calls for boiling the jelly for 10 minutes. However, I live at high altitude which means the water boils at a lower temperature and I have to boil longer. I let mine boil for 20 minutes. Take the jars out and set them on a counter. Within 24 hours, all the snap lids should have “popped” and curved downward. If any jar has not done this, use it immediately, it is not sealed for long term storage. This is a delicious jelly. It sets up a bit thicker than I would like but the taste is marvellous. The sweet richness of the apricots is a great foil for the heat and bitterness of the peppers. Boil six 125 ml (1/2 cup) canning jars in a hot water canner. Keep the jars in the hot water until filling. Put the apricots and vinegar in a stainless steel pot for 4 hours. Add the onion, peppers and sugar. Bring to a boil over high heat, stirring constantly, until the mixture comes to a full boil that can not be stirred down. Add the pectin and boil for 1 minute, stirring constantly. Pour the jelly into the hot jars to 1/4 inch from the top. Wipe the rim with a paper towel. Centre a snap lid that has been soaking in hot water on the jar. Attach a screw band and tighten fingertip tight. Put the jars back in the hot water canner and bring it to a boil. Boil for 10 minutes. If you live at high altitude, you will need to increase the boiling time. Within 24 hours, the snaps lids should "pop" and curve downwards. Use any jars that have not "popped" immediately.